Tariffs introduced by the United States on Canadian steel and aluminum that sparked counter tariffs by the Canadian government can only add up to one thing for Canadian wholesalers and contractors – higher costs on just about everything. In fact, some products are being hit with tariffs going both ways – those that are made in the U.S. from Canadian steel and then shipped to Canada. Some water heaters fall into this category. Far from helping the U.S., these tariffs are pushing up prices on that side of the border too. Matt Michel, CEO of Service Roundtable, a U.S. contractor consulting group, notes that almost all prices will rise because virtually every industry that uses steel and aluminum will be affected. 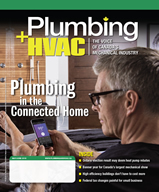 "The (Donald) Trump administration is ignoring history as they downplay the impact of the tariffs across the broader economy," he remarked in an article in the May 28 issue of the U.S.-based Air Conditioning, Heating and Refrigeration News (www.achrnews.com). Canadian manufacturers, if they are using Canadian steel and aluminum, may be somewhat protected on this side of the border. However, they also export to the U.S., so the tariffs probably won't help. The U.S. and Canadian economies are so interwoven that anything that affects Canada affects the U.S. and vice versa. The George W. Bush administration introduced steel tariffs in 2002 and dropped them 18 months later due to thousands of jobs lost in U.S. manufacturing. However, the current U.S. administration tends to ignore things like history, logic, established practices and protocols, facts, etc. Donald Trump and his colleagues believe fundamentally that trade agreements are detrimental to the U.S. – despite all the evidence that shows otherwise. That makes it almost impossible to predict where this will end up. We are looking into just how much these price increases might be on different types of plumbing and HVAC equipment and supplies. Contractors need to be able to explain this to their customers. And, in some cases, it might make sense to stockpile certain pieces of equipment where a significant price increase is coming, if it hasn’t already. The president's behaviour, including the bizarre attack on our prime minister that was so deeply offensive to every Canadian regardless of political persuasion, causes considerable doubt that these issues can be resolved through negotiation. Business large and small on both sides of the border faces a rough ride until, at the very least, the next U.S. presidential election on Nov. 3, 2020. It's not going be easy.